Meteorological Electronics Technician Kirk Wilson eyes the top of a 30-foot tower as he prepares to replace a wind sensor at an Oklahoma Mesonet station near Shawnee, Okla.
Scientists are getting better and better data on the earth's changing climate. Now there's a push to take advantage of the information stream to help us cope with the extremes we know are coming. One leader in this is Oklahoma. In a cow pasture near Shawnee, Kirk Wilson parks his work truck, grabs a harness and prepares for a 30-foot climb. “We’re changing the sensor at the top of the tower that measures the wind direction,” said Wilson, a burly meteorological electronics technician with a big beard and a booming laugh. On the ground, another tech uses a GPS receiver to make sure the sensitive instrument is properly aligned before it’s tightened in place. When this station — No. 84 — is back online, it’ll resume beaming bursts of measurements on more than a dozen factors, including wind and air pressure, temperature, soil moisture and solar radiation. 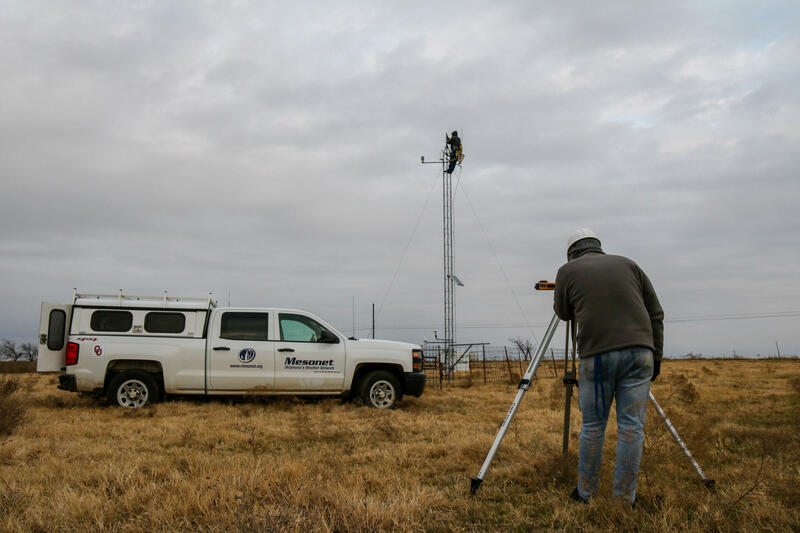 Oklahoma has 120 of these stations scattered across the state, one of the country’s largest and most sophisticated “mesonets,” a moniker that references the meteorological term “mesoscale,” describing where most storms and atmospheric events occur. On this day, the real-time info is helping forecasters track a winter storm. Longer term, the measurements will fill enormous datasets used for climate science, agriculture, industry and government. Chris Fiebrich, associate director of the Oklahoma Climatological Survey and manager of the Oklahoma Mesonet, explains how sensors are tested and calibrated in the network’s headquarters at the University of Oklahoma in Norman, Okla.
As scientists get more and better data on earth’s changing climate, there’s a push to use it to help people cope with the effects of climate change. The recent National Climate Assessment urged states to follow Oklahoma’s lead and create early warning systems to help communities prepare and adapt. 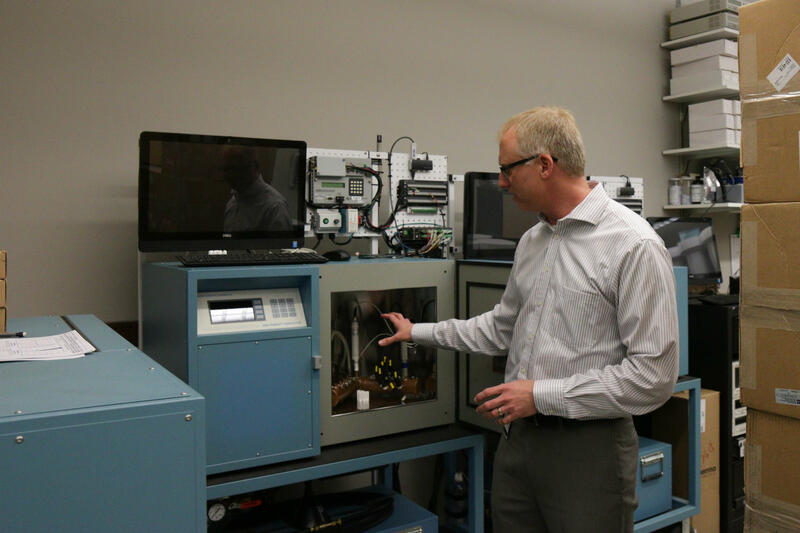 “We’re not only collecting the data every five minutes, but we’re trying to get it out to the decision-makers within five minutes,” said Chris Fiebrich, associate director of the Oklahoma Climatological Survey who manages the Oklahoma Mesonet. Those decisions could be small ones, like postponing a high school football game, or ones with much higher stakes, such as predicting catastrophic flooding, or drought — or modeling potential wildfire danger. “Firefighters can know how fast a fire might spread if it were to break out today, or how high the flames might be, and that helps them preposition things or get things ready,” said Fiebrich. “There’re enormous possibilities for how we could use early warning systems to make our health systems much more effective,” said Kristie Ebi, a professor at the University of Washington who studies the health risks of climate change. In Phoenix, officials are using weather and climate data to predict and prepare for deadly heat waves. In Singapore, the data are used to create a seasonal forecast for dengue fever. Information isn’t the same thing as action, however, and Ebi said generating and making data available doesn’t guarantee a decisive response. One example she points to is a meteorological model researchers developed in 2016 that warned conditions in south Florida and south Texas could lead to more mosquitos and outbreaks of Zika virus. Meteorological Electronics Technicians Christopher Bieschke and Kirk Wilson replace a wind sensor atop a 30-foot tower at an Oklahoma Mesonet station near Shawnee, Okla. Researchers published a scientific paper, which received national media coverage, “but there was essentially no significant public health response,” Ebi said. The next step, she said, is finding, funding and empowering a public response to the increasingly accurate predictions about the effects of climate change.